As I sit at my desk, gazing out my window, I can feel its approach. I see the ominous grey hues of cloud, trees swaying as if stuck in a slow dance to music nobody can hear. There’s the smell of rain here, a beautiful smell that I’ve never experienced anywhere else. Its one I have looked forward to year after year. There is almost a sense of relief, from all this build up, all the heat, that stubborn, slow and relentless clambering up the barometer, pushing upwards and onwards blazing, soaking people’s skin in perspiration. The sky darkens till it looks like the apocalypse at 5pm on a regularly sunny summer day. My first summer back in ten years, has been a long brutal one, compounded by the fact that I have exceptionally poor air conditioning karma. My unit in my bedroom has seen more than two decades of Delhi heat, and so now, occasionally, it just stops cooling for no apparent reason. When we removed the cover of the air conditioner to investigate, we discovered a large block of ice essentially covering the inside of the unit, and preventing any cool air from coming out. The air conditioner is, in fact, too cold and this is an issue in 46-degree (Celsius) weather. There is the complicated manipulation of switches and thermostat routine I am supposed to do to kick start it again, but generally, at 3 am when I wake up drenched in sweat, I give up on what dial I’m supposed to move where, and go sleep in my brother’s empty bedroom. Life is too short to cater to the whims of a high-maintenance air conditioner. At work, the air conditioner didn’t work for the longest time. I kept getting told it was “the setting”. The remote control has a zillion buttons on it, each with pretty unintelligible symbols that I haven’t pressed for fear of screwing up “the setting”, but nobody can seem to explain to me which of these is “the setting” in question. Every time the guys come to fix it, it suddenly remembers it’s true function and freezes not just my workspace but the entire floor. Eventually we manage to convince the maintenance guys, and they just replace the whole thing. As a result, I am finally able to find some relief during the workday. Today the rain doesn’t come right away. It makes us wait, strings us along, baiting us to show a glimmer of excitement for relief from fire. The air is thick, heavy, and oppressive. It pushes against your skin like someone who shoves past you on the metro, no rather someone who has squeezed into a tiny space beside you on the metro and is now making way more bodily contact than you ever imagined was possible. It starts shortly after 6pm, a cheeky insult to most of the Delhi population, as this is generally the beginning of their already-painful evening commute. In the West, it was always sort of weak and drizzly, almost like a whiny irritating friend that didn’t have the good sense to know when to stop talking and go away. Here it is powerful, a production, a stage performance of Mother Nature showing her might. Here most people celebrate the rain. It is an end to the most unbearable and extreme of Delhi temperatures. It is the final frontier before (relatively) cooler autumn temperatures. The roads are soaked, their unevenness apparent by the spontaneous birth of several small and not-so-small puddles that must be carefully navigated, lest you slide away. The cows and select two-wheelers and pedestrians take shelter under the flyovers and peer out at us as we drive by. Random bits of debris are carried away by wind. Drops angrily attack our windshields, hammering down on us like jilted lovers. It is chaos. But all the elements churn together just like they do: year after year after year. 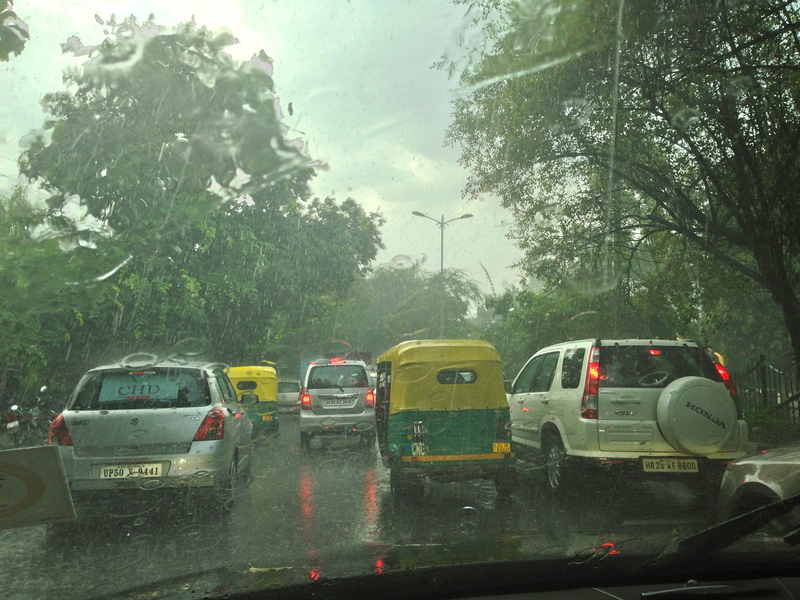 This is also one of the only times of the year, that you really see how green and beautiful Delhi can be: soaked, subdued, and overpowered. One of your best written pieces Mira. When I grow up I want to be just like you! Thank you 🙂 Umm and shouldn’t that go the other way round? ?